Spherical Plain Bearing GE.C Series is also known as a plain bearing. The first thing is that its appearance is spherical. There is an inner ball and a outer ball combined in one way. You can use it to move it freely in the interior of the equipment. It has a strong bearing capacity, high pressure resistance and good lubrication. Spherical Plain Bearing GE.C Series is also known as a plain bearing. The first thing is that its appearance is spherical. There is an inner ball and a outer ball combined in one way. You can use it to move it freely in the interior of the equipment. It has a strong bearing capacity, high pressure resistance and good lubrication. Spherical Plain Bearing GE.C Series is used in automotive shock absorbers, construction machinery and equipment, and some marine equipment. It can separate the absorbed force, so the force it can absorb is more powerful. The bearings and their surrounding accessories should be kept clean, especially dust and dirt, and the tools and working environment must be kept clean. Be careful when using the Spherical Plain Bearing GE.C Series. Strong stamping is not allowed. It is not allowed to use a hammer to directly hit the self-aligning ball bearing. 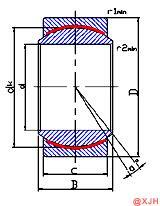 It is not allowed to transmit pressure through the rolling element. Try to use special tools and try to avoid using cloth and short fibers.